Sigourney Weaver and Key Cast Members from Ridley Scott’s Classic 1979 Film Alien Add Their Voice and Likeness to Two Downloadable Bonus Levels. SAN FRANCISCO and LONDON – July 9, 2014 – SEGA® of America, Inc., SEGA® Europe, Ltd. and Twentieth Century Fox Consumer Products today announced exclusive pre-order bonus content for Alien: Isolation™, featuring the vocal talent and likenesses of key cast members of the 1979 Ridley Scott masterpiece, Alien. Academy Award-nominated and Golden Globe-winner Sigourney Weaver (Ellen Ripley), Tom Skerritt (Dallas), Veronica Cartwright (Lambert), Harry Dean Stanton (Brett), Yaphet Kotto (Parker) and Ian Holm (Ash, likeness and sound-alike) are set to feature in two downloadable bonus missions, which allow you to relive two classic scenes from the movie. Anyone who pre-orders the game will get a free upgrade to the Nostromo Edition, which includes the bonus content “Crew Expendable”. Players can choose to play as one of three surviving crewmembers, only moments after Brett’s death at the jaws of the creature. As Ellen Ripley, Dallas or Parker, players can explore the Nostromo from habitation deck down through engineering, coordinating their efforts with Lambert and Ash to lure the Alien into the ship’s airlock. 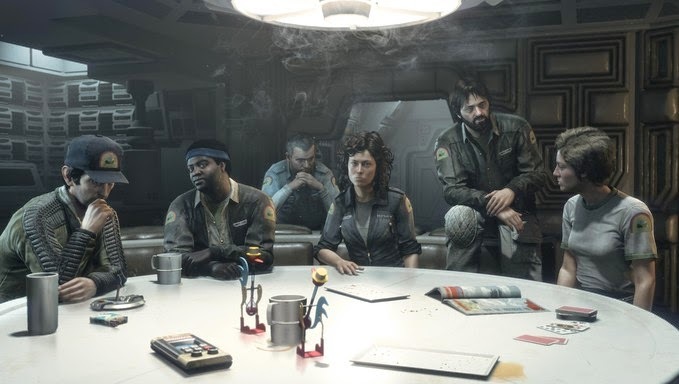 In addition, consumers who pre-order at GameStop will exclusively also receive “Last Survivor” in which players pick up the story as Ripley tries to escape on the Narcissus. On hearing the screams of Lambert and Parker, players must navigate their way back down through the Nostromo in order to activate the self-destruct sequence, before retracing their steps back to the Narcissus shuttle and their escape. Alien: Isolation will be available from October 7, 2014, for Xbox One the all-in-one games and entertainment system from Microsoft, PlayStation®4 computer entertainment system, Windows PC, Xbox 360 games and entertainment system from Microsoft and PlayStation®3 computer entertainment system. SEGA also announced that they will have the pre-order content available for people who didn't pre-order the game later after it's release but at an unconfirmed date. Pretty standard for all game releases with preorder bonuses.